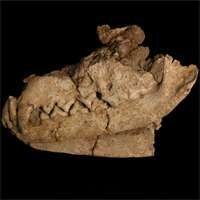 (PhysOrg.com) -- Early humans may have preferred the fox to the dog as an animal companion, new archaeological findings suggest. Researchers analysing remains at a prehistoric burial ground in Jordan have uncovered a grave in which a fox was buried with a human, before part of it was then transferred to an adjacent grave. The University of Cambridge-led team believes that the unprecedented case points to some sort of emotional attachment between human and fox. Their paper, published today, suggests that the fox may have been kept as a pet and was being buried to accompany its master, or mistress, to the afterlife. If so, it marks the first known burial of its kind and suggests that long before we began to hunt foxes using dogs, our ancestors were keeping them as pets - and doing so earlier than their canine relatives. The cemetery, at Uyun-al-Hammam, in northern Jordan, is about 16,500 years old, which makes the grave 4,000 years older than the earliest known human-dog burial and 7,000 years earlier than anything similar here involving a fox. Writing in the open-access journal, PLoS One, the researchers also suggest that this early example of human-animal burial may be part of a bigger picture of growing cultural sophistication that has typically been associated with the farming societies of the Neolithic era, thousands of years later. Sadly for fox-lovers, however, the relationship between man and that particular beast was probably short-lived. The paper also says it is unlikely that foxes were ever domesticated in full and that, despite their early head start, their recruitment as a friendly household pet fell by the wayside in later millennia as their human masters took to the more companionable dog instead. "The burial site provides intriguing evidence of a relationship between humans and foxes which predates any comparable example of animal domestication," Dr Lisa Maher, from the Leverhulme Centre for Human Evolutionary Studies, University of Cambridge, said. "What we appear to have found is a case where a fox was killed and buried with its owner. Later, the grave was reopened for some reason and the human's body was moved. But because the link between the fox and human had been significant, the fox was moved as well, so that the person, or people, would still be accompanied by it in the afterlife." The research focused on the contents of two particular graves at Uyun-al-Hammam, which is situated on an ancient river terrace in the small river valley of Wadi Ziqlab. The site has been one of major interest for archaeologists since the first graves were opened in 2005 because it provides a rich source of information about the so-called early Epipalaeolithic period, 16,500 years ago. The Cambridge-led team spotted a connection between Grave I on the site and Grave VIII, which lies beside it but was only opened more recently. In the first, they identified the remains of two adults, probably a man and a woman. The man had been buried earlier than the woman, and alongside him were the skull and humerus of a fox, as well as other grave goods. It was only when Grave VIII was opened, however, that the researchers found both human remains that may have belonged to the same man, and the skeletal remnants of what was, almost certainly, the same fox.The fox skeleton was complete apart from its skull and right humerus - which is exactly what they had already found in the adjacent grave. Further studies indicated that the remains were indeed those of a red fox. The movement of the body parts is believed to be highly significant. If the human body is the same in both cases, then none of the other grave goods except the fox were considered worth moving, strongly suggesting that the fox had some sort of special relationship to the human. Other such cases are very rare. Many of the next earliest involve dogs, including one site in Israel where a woman was buried with her hand resting on a puppy, but even they are about 4,000 years younger than Uyun-al-Hammam. "The very first evidence of dog domestication in the Near East involves a burial of a puppy with a human," Dr. Jay Stock, also from the Leverhulme Centre at the University of Cambridge, said. "It's easy to imagine that the similarly-sized fox was also viewed by prehistoric people as a potential companion in the same way. Clearly, it had significant social status." Studies carried out on foxes suggest that they can be brought under human control, but that the process is not easy because they are skittish and timid by nature. Perhaps for that reason, the researchers suggest, dogs ultimately achieved "best friend" status among humans instead. A lot of supposition and speculation based upon a single find. Might not the fox(as opposed to being a pet) have been an animal of some religious, tribal, or totemic meaning in the context of the burial? Fox spirits are considered malevolent in many cultures and are often taken to be able to inhabit the souls of people who behave badly. I wonder if this might have something to do with this burial? @ Caliban--On another website they write: "The fox was treated in a special way from any other animals at the site," Maher told LiveScience. "...for instance, it could have had some spiritual meaning instead," Maher said. Also, foxes did not always receive special treatment — other fox bones at the site bore signs of butchery and cooking, suggesting they were eaten for meat. @plaasjaapie--by "many other cultures' do you mean Chinese, Japanese and Korean? That's 3 not "many". In the west fox is seen more as a trickster/mischief maker not a malevolent spirit. @thingumbobesquire--your example is not germane to the topic since Lord Byron obviously comes form the Historic Era, not the Prehistoric. Obviously none of you are very knowledgeable about archaeology or anthropology. Most tribal cultures even today keep various pets, usually the helpless offspring of mothers killed for food; so they are not at all domesticated, but tamed, there's a difference. Thanks for sharing. I know I speak for everyone here when I say just how much we appreciate your willingness to give us the benefit of your superior understanding and insight.